Back in the PlayStation 2 days, store shelves were practically drowning in mediocre 3D platforming games aimed at kids. 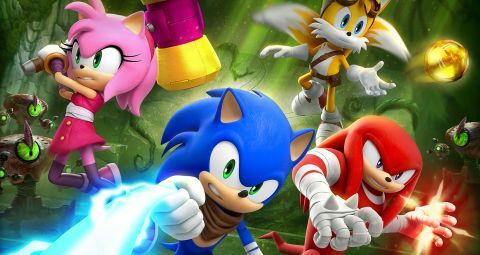 It may be a Wii U title that came out this year, but Sonic Boom: Rise of Lyric would have fit in perfectly next to middling games starring The Incredibles or Spongebob Squarepants in 2006. Neither outstandingly good nor bad, and making the assumption that younger gamers are fundamentally less skilled, Sonic Boom seems doomed to fade into obscurity just like its spiritual predecessors. The kid-filled toy and comic ads on the back of the manual should be a tip-off. If you miss those, the Saturday morning cartoon nature of Sonic Boom's introduction makes it quite obvious that this isn't a game for steely-eyed hedgehog veterans. On the run from the ever-present villain Eggman, Sonic and his buddies take a painfully easy trip through a jungle race track before accidentally unleashing an ancient evil snake named Lyric. Lyric is mad at the world and obviously in need of hugs, so of course the answer to beating him involves demonstrating the power of friendship. Everybody in the cast is exuberantly child-friendly and far too willing to share obvious tips on what to do next. It's all perfectly great if you're eight years old, but pretty annoying if you're not. Although it becomes increasingly complex and interesting later on, Sonic Boom is rarely challenging to play. Just as with the kid-friendly story, that's either a positive or negative depending on who is playing. This is more of a exploration-based adventure than the speed-based platformer that fans of classic Sonic games might expect. Most of the game is spent ambling along, exploring and solving simple puzzles rather than running through fast-paced mazes. While there are times when Sonic and company go fast, they're either non-interactive moments or are segments that don't require much in the way of reflexes. Battles are separated out from most platforming segments and are marginally more difficult than normal gameplay, but still quite forgiving. This lack of challenge is just as well, because the controls are slippery and the camera can be problematic. Sonic and friends move a bit like a car with an overactive accelerator, making it very easy to slip off platforms or overshoot targets. The camera, though far from the worst I've encountered, gets stuck at times and doesn't show the entire battlefield during fixed-camera combat segments. It's no fun to fall off the stage because you can't see where you're going, and it's no fun to be shot by a robot that is standing off stage-right. At least Sonic's healthy life pool means that death in combat is rare, and frequent checkpoints help keep falling deaths from being terribly inconvenient. There are a couple ways to personalize Sonic and his team. You can spend the crown orbs that are hidden all over the world to unlock power-ups. These are quite useful, especially Secret Stash, which allows you to return from being knocked out with a reserve of extra health. It's great for those camera-induced falling deaths. Completing side quests awards power shards, which boost a character's combat abilities. You can mix and match shards between characters, so Sonic can create extra explosions after defeating a foe while Amy decides to live on the edge and do more damage when her health is low. Most of the power shard choices are situational or uninteresting, so I generally kept the explosive shard equipped on everybody. Boom! Where Sonic brings the fun is in the variety in the action that it offers. Many sections of the game are quite entertaining despite the lack of difficulty. Zip-lining, dashing atop water, and leaping all over a giant robot are among the highlights. In addition, each of the four playable characters (Sonic, Amy, Tails, and Knuckles) has a unique fighting style. Busting evil robots with Sonic feels appropriately frenetic, while Tails requires a more strategic approach and Knuckles packs a satisfying punch. Everybody has special out-of-combat abilities as well. It's particularly fun to hover-glide as Tails and do gymnastics as Amy. Tails’ ability is flexible and great for surveying levels, reaching secret areas, or making difficult jumps much easier. Amy can only do gymnastics on special pink platforms that let her balance, swing, and flip around, but her lively animations make these segments feel exciting. Things fall apart a bit when Sonic and friends depart from the more linear action-packed levels and roam around the sparse hub world that connects them. Dull and difficult to navigate, it's particularly bad in the beginning when there's no map available and Team Sonic is dumped into it without any instructions. Even after its map is finally unlocked and the destinations are made clear, the hub world could have easily been replaced by a menu that allowed players to get to the good stuff as quickly as possible. Several other flubs in quality keep Sonic Boom from being a great game even for the younger set that it's meant to entertain. Sometimes the sound cuts out for a moment, or it feels like pieces of the story cut-scenes are missing. It’s difficult to tell if the story is disjointed or if scenes are being skipped by a technical error, but it’s jarring either way. A few game segments also stroll into awful mandatory mini-game territory. Particularly bad is the twin-stick shooter level, which drops you onto a boat and forces you to steer with the left stick and shoot with the right while a million bad guys come at you. It's hard to control and unlike the rest of the game, offers few opportunities to refill the health bar between enemy waves. I wouldn't be surprised if this is the point where the targeted kiddos throw in the towel. Sonic Boom: Rise of Lyric comes close to being a decent platformer for the elementary school crowd. It certainly abounds with youthful enthusiasm, and that works well during its better action sequences, or when Knuckles gleefully exclaims, “Bounce pads are cool!” If its developers had resolved its control and camera issues, cleaned up the cut-scenes, and shot the twin-stick boat level into outer space, it could have at least been a decent holiday gift for the little ones. Instead, it's a forgettable game that is greatly outshone by other Wii U offerings this year. Kids who are in love with the Sonic cartoon that's currently on TV might dig it for a while, but everybody else can find far better games to play. Description Sonic, Knuckles, Tails, Amy, and Sticks must stop Lyric from destroying the world.